uuid : 7cc0ad0d-da9c-4664-b9a1-a6f90937bbac templates_id: 119620 templates_uuid: "c1305034-f400-4177-97d1-2a77a9296c22" title: "Terms & Conditions for Sale of Goods to Consumers via a Website" display_name: "Terms and conditions for sale of goods to consumers via a website" meta_keywords: "T&C\'s for sale of goods on a website" description: "
Protect your business with clear and fair terms and conditions for the sale of goods to consumers via a website. Use these standard terms and conditions for any business in England & Wales that sells goods online to consumers. They are designed to be straightforward and comprehensive so that customers know where they stand and needless disputes can be avoided. They cover key issues such as orders, delivery, pricing, payment, guarantees, cancellation, liability, data privacy and security, and they are compliant with consumer rights legislation. What are terms and conditions for the sale of goods to consumers via a website? Terms and conditions for the sale of goods to consumers via a website (also known as T&Cs) should be used if you want to sell goods online to a consumer on standard terms. They should cover key issues such as orders, delivery, pricing, payment, guarantees, cancellation, liability, data privacy and security. Why do you need terms and conditions for the sale of goods to consumers via a website? Terms and conditions for the sale of goods to consumers via a website protect your business interests, ensure that customers know where they stand and help avoid disputes. How do I implement terms and conditions? Terms and conditions must be clearly brought to the customer\'s attention before the sale takes place to ensure that they are binding on the customer. There are various ways of doing this. Usually customers are deemed to accept the T&Cs by placing an order. However the best way to ensure that the T&Cs are accepted are by requiring the customer to check a box stating that they accept them before the order is placed. Ideally the tick box includes the terms and conditions or a hyperlink to them allowing the customer to store and reproduce them at any time. What are the statutory rights of consumers? Read Doing Business with consumers for more information. When do I have to refund a consumer? Consumers are entitled to reject the goods if they are of unsatisfactory quality, unfit for their purpose or not as described within 30 days from the date they bought the product. You can also choose to offer a returns policy whereby the consumer may change their mind about the goods for any reason (or for no reason) within a short period of time after receipt of the goods. Should I provide a guarantee? You may wish to provide a guarantee to repair, replace or refund goods which are faulty. In addition to the manufacturer\'s guarantee, you may wish to offer a guarantee if you are in a position to repair, replace or refund the goods. In any case, such a guarantee also exists as a statutory right, as long as the customer can show that the goods are faulty. Can I specify when payment is required? You can state in the T&Cs the time period for which payment is required for the goods. However the time period between payment and delivery of the goods can\302\222t be too far apart (eg 1 year in advance of the service). You should agree beforehand in the T&Cs whether you will charge interest on overdue payments. It will be up to the parties to agree on the amount of interest payable. However the interest rate should not be unfair or unreasonable to the consumer. What if I provide tailor-made or customised goods? It is possible to exclude the possibility of a refund in the case of goods which are made to order. However such an exception wouldn\302\222t affect a customer\302\222s statutory rights in relation to faulty of misrepresented goods. What else should I provide in T&Cs? It\302\222s a good idea to provide an email and/or postal address where the customer can send communications which must be in writing, such as a notice cancelling the order or return of purchase. You should also set out the accepted payment methods and terms (eg provide that payment must be made when an order is placed but credit and debit cards will not be charged until goods are dispatched).
" created_timestamp: "2018-10-09 06:36:16.0" modified_timestamp: "2018-10-09 06:36:16.0" active: true created_by: 236 modified_by: 236 dcm_id: 206 url_slug: "Terms-and-conditions-for-sale-of-goods-to-consumers-via-a-website" meta_description: "Create terms and conditions for selling goods online with simple guidance from Rocket Lawyer. Protect your business with clear terms for the sale of goods online. Try these standard terms and conditions for free." time_to_complete: "20 minutes" role1: "Seller" role2: "Buyer"
Terms and conditions must be clearly brought to the customer's attention before the sale takes place to ensure that they are binding on the customer. There are various ways of doing this. Usually customers are deemed to accept the T&Cs by placing an order. However the best way to ensure that the T&Cs are accepted are by requiring the customer to check a box stating that they accept them before the order is placed. Ideally the tick box includes the terms and conditions or a hyperlink to them allowing the customer to store and reproduce them at any time. You may wish to provide a guarantee to repair, replace or refund goods which are faulty. In addition to the manufacturer's guarantee, you may wish to offer a guarantee if you are in a position to repair, replace or refund the goods. In any case, such a guarantee also exists as a statutory right, as long as the customer can show that the goods are faulty. You can state in the T&Cs the time period for which payment is required for the goods. However the time period between payment and delivery of the goods cant be too far apart (eg 1 year in advance of the service). It is possible to exclude the possibility of a refund in the case of goods which are made to order. However such an exception wouldnt affect a customers statutory rights in relation to faulty of misrepresented goods. Its a good idea to provide an email and/or postal address where the customer can send communications which must be in writing, such as a notice cancelling the order or return of purchase. You should also set out the accepted payment methods and terms (eg provide that payment must be made when an order is placed but credit and debit cards will not be charged until goods are dispatched). More than just a Terms and conditions for sale of goods to consumers via a website template, our step-by-step interview and guidance makes it easy to create your document. Easily create online, download, print and sign your free Terms and conditions for sale of goods to consumers via a website in minutes. 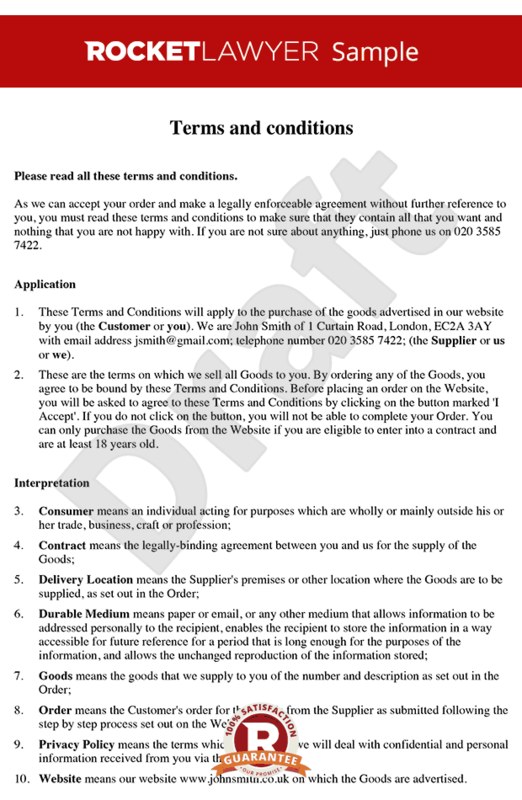 This document is also sometimes called: T&C's for sale of goods on a website.